The Olney Terrier has been spotted across Northamptonshire, and most recently in Northampton. 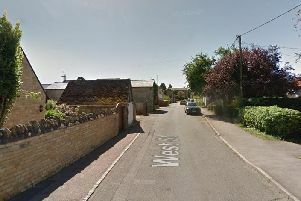 A three-week search to find and safely catch a feral dog who has been sighted across the county has reached Northampton. A ginger terrier with two white front feet was spotted in St Giles Street on Monday (November 20) - but what witnesses might not have known is there are hundreds of people in Northamptonshire trying to find her. Over 450 people have joined a Facebook group to find her and bring her safely to a vet. She is known only as the Olney Terrier and so far she has been spotted in Olney, Bozeat, Wollaston, Castle Ashby, Brackmills, and now Northampton town centre. "It's amazing what this dog can do," Geraldine Guy, a member of Wellingborough Dog Squad and a member of the 'Olney Terrier' Facebook group set up to track down the gallivanting canine and bring her to a vet. "She's clearly such a fit little dog and has outwitted us at every step." The Olney Terrier was first reported on October 31 in the rural village she was named after, and a Facebook group set up to find her now has over 450 members. The Olney Terrier has been spotted across Northamptonshire - from Olney, to Wollaston, to Milton Malsor. Their mission is to track her down and humanely trap her so she can be taken to a vet. But now, with the cold weather setting in, the hunt to bring her in has grown even more urgent. Geraldine, who has experience rescuing wild dogs, said: "Until we trap her and bring her to a vet we'll never know if she's lost, or has been abandoned, or is just feral. "We're trying to make her feel safe in one area so we can get to feed in the same place. From there, we can more easily trap her. "We're not going to stop until we've got her. We will not give up on her." The Olney Terrier is already on the move, and she was spotted today (November 20) in Milton Malsor. Geraldine asks anyone who spots the Olney Terrier not to chase or grab her as it will only spook her. Anyone who sees the lost pooch can call 07960 132901 to report what they've seen. Alternatively, sightings can be reported by joining the Olney Terrier Facebook Group.